Ephlux has always been approached over the years by numerous seasoned, mid-level and fresh JD Edwards consultants in search of our AIS Integration Training that has helped them integrate Application Interface Services (AIS) to 3rd party applications, enterprise cloud apps. We couldn’t be more than happy to announce the launch of our Application Interface Services (AIS) Training that guarantees proven results! JD Edwards developers who wish to enhance their skill set and learn advance integration techniques with JD Edwards using AIS. 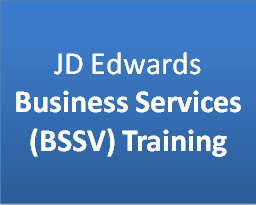 Note: Based on our experience so far training some busy JD Edwards consultants, we’ve felt a need to split up the training into more days so that the consultants can balance their customer projects with the training. This helps the consultants have enough time to balance their current engagements along with ample time to practice the lab exercises. We prefer customizing the training based on your specific needs. Please fill the form below and we’ll get in touch to help you customize the training that best suits your needs and budget.